The great thing about technology is that its always evolving. Smartphones and tablets merge in the popular “phablet” crossover models. Laptops and tablets are starting to come together as well. I recently picked up the Sony Vaio Flip, a gorgeous Full HD laptop that flips into a touchscreen tablet. This innovative laptop offers three versatile modes: laptop, tablet and viewer to work, play and display. 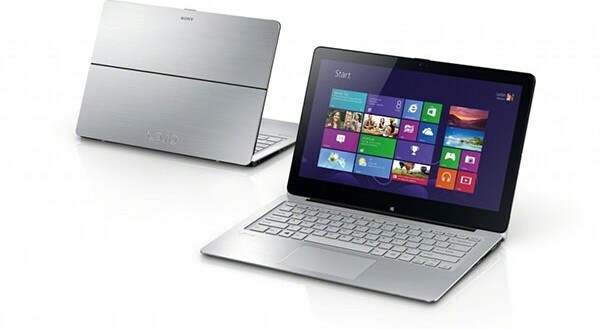 This Sony Vaio features a 14” full HD multitouch screen. TRILUMINOS display for mobile enables a rich palette of natural colors and the display responds to finger touches or an optimized stylus. The 1920 x 1080 resolution makes it perfect for wide viewing angles. This ultra-low-voltage platform features a 4th Gen Intel Core processor. Dual-core, four-way processing provides maximum high efficiency power to go. Intel Turbo Boost Technology delivers dynamic extra power when you need it. The 8 GB of system memory is perfect for the modern multitasker. Substantial high-bandwidth RAM smoothly runs your games and photo/video editing applications, as well as multiple programs and browser tabs simultaneously. Of course you also get the Microsoft Windows 8 operating system. This is designed for touch, mouse and keyboard no matter what your preference is. Use the touch screen to easily zoom and customize your new Start screen or restore the traditional Windows desktop experience. Standard software includes Sony Movie Studio Platinum, ACID Music Studio, Sound Forge Audio Studio and more. Whether you’re a gamer, designer, or other creative type, this is the laptop for you. Retail for the 14” model starts at $899, this is a great price for a laptop with all the latest features.